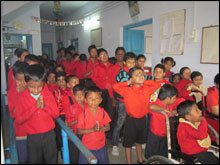 Jalpaiguri Welfare Organization is working for the disabled population for their proper rehabilitation since 1984-85. Successful & meaningful rehabilitation of the differently able children to the main-stream of the society through quality education and special care was the thought which inspired JALPAIGURI WELFARE ORGANIZATION to start the centre in 1987. Through this centre of ours all types of physically challenged children (CP, MR, HH, VH, MD) are getting education using modern techniques. Since its inception, the centre has been earning reputation to attract the students, the number of which is at present 191.Many bonafide students of this school have got enrolled in the normal school and have done well in the Secondary & the Higher Secondary Examination.In addition the students are also involved in the co-curricular activities like Art Competitions, Nature Study Camps, Sports, & other Cultural Programmes and have brought laurels to the centre. Like previous years this year too the students of our centre proved their excellence in the field of sports and games in various places in West Bengal. The centre is helping the guardians of the children to get the certificates and necessary aids and appliances from the government sector. This year the centre has attracted the attention of the mass by participating in the different cultural programmes at Disabled Day Function, Durga Puja Inauguration Programme, Book Fair etc. this senior students were given an Identity Card and were also provided special training for ensuring self-employment. 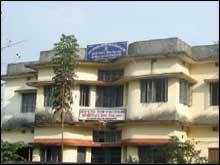 Jalpaiguri Welfare Organization feels the need of special and focused efforts for the proper functioning and supervision of the school. We are thankful to the Department of Social Welfare for awarding Scholarship to the students of our Special Education Centre. Services extended to the students through this centre include (a) Mobility Training (b) Braille through Computer (c) Special education (d) Self-Help (e) Physiotherapy (f) Audio- tactile method (g) Use of Hearing Aids (h) Speech Therapy (i) Group Hearing Therapy (J) Scholarship (k) Home – based management (l) pre-vocational training etc. 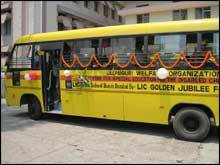 LICI Golden Jubilee Foundation donated a School Bus for the students of our school. The school bus is the only bus in the entire district that is dedicated to the students with special needs. A sense of belongingness has developed in our students. The confidence level of students is increasing as they travel together without the help of others. They really enjoy their journey daily. We are really owe to the LICI Golden Jubilee Foundation for their noble gesture and supporting us to fulfill our zeal for the betterment of the children with special needs..
2014-15 Annual Performance Report 2014-15 on DDRS. 2015-16 Annual Performance Report 2015-16 on DDRS. 2004-13 Annual Report JWO - 2004-13. 2013-14 Annual Report JWO - 2013-14. 2014-15 Annual Report JWO - 2014-15. 2015-16 Annual Report JWO - 2015-16. 2014-15 List of Beneficiaries 2014-15. 2015-16 List of Beneficiaries 2015-16. 2016-17 List of Beneficiaries 2016-17. 2014-15 Executive Committee Members 2014-15. 2015-16 Executive Committee Members 2015-16. 2014-15 School Progress Report 2014-15. 2015-16 School Progress Report 2015-16.